Fancy some beans on toast for lunch at work but don't have a microwave and the canteen "don't do pov food"? Or maybe your cup of coffee has gone cold and you wish you could quickly zap is in the microwave, but alas, that thing would look silly on your desk and never pass the company "electrical compliance test" anyway. How cool is this? The Beanzawave, which measures just 7.4 inches tall by 6.2 inches wide and 5.9 inches deep, doesn't even need to be plugged into an electrical outlet. The device contains a USB port, so mid-afternoon snacks can be heated up at the computer without the need for "electrical appliance clearance", additional plugs or even getting up off your fat bum. Maybe desk-side hot beans aren't for you, but just think of the other possibilities. Warming baby food/bottles on the go. Camping dinners. Driving dinners. Hot cups of cocoa/coffee whilst out fishing. All are possible provided you pack your fully charged laptop - which you'll have anyway wouldn't you ;-) . 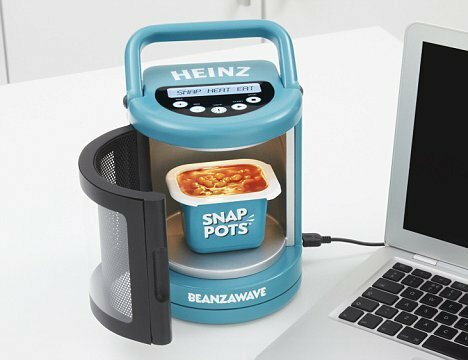 Of course, the price - about £100 - if ever released, would mean it would be pointless getting one of these for general home use as you can buy a cheap microwave in Tescos for about £30. Apart from its size, the key breakthrough is the use of a combination of mobile phone radio frequencies to create the heat to cook both on the outside and within in under a minute. Hang on a sec... if mobile phone radio frequencies can cook beans, what are they doing to my head?